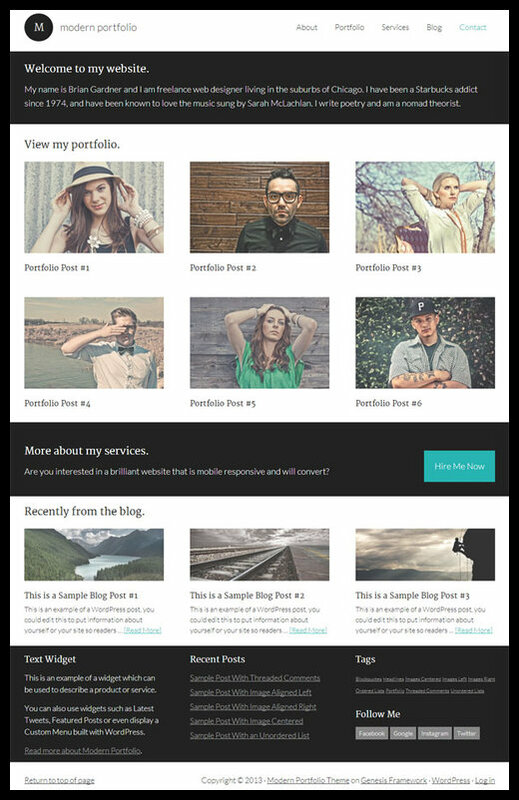 Modern Portfolio WordPress Theme by StudioPress is modern responsive portfolio theme works with Genesis Framework. Modern Portfolio Theme is mainly developed for designers, developers, photographers or any freelancers to create personal website where they can showcase their creativity or skills using portfolio. The template provides wide screen size to display more contents without distracting visitors attention. The main attraction of the theme is high-contrast and black and white frame to highlight images. Modern Portfolio Theme provides unique homepage design where you can display all the details using variety of blocks, the first block allows you to display personal detail along with welcome introductory message. The second block is for portfolio showcase with three column structure, here you can display all of your creative task using unique portfolio presentation. Then third block enables you to write about your service or expertise with beautiful button which takes your clients through a beautiful business landing page provided with the template. Modern Portfolio Theme also displays recent blog updates on the front-page to intimate visitors about latest news directly from the main page. Moreover footer section is fully widget friendly here you can implement custom text, recently released post links and social media buttons and more. On the header section you will have freedom to add business logo or text message you wish to write. Thus minimal and unique portfolio design, clear typography and wide spacing is the main point that will make your presence totally unique.